Idiots exist, says L. Summers. 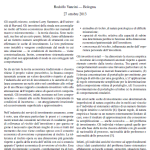 For a brief introduction on behavioral finance download the Behavioral Finance primer. Some (preliminary text-mining) on #eurocrisis on Twitter using R.
While trying to answer the question where liquidity began to leak back in 2007 download the whitepaper. 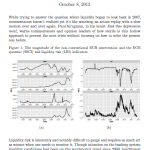 Liquidity: where has it all gone (part 2)? An update on liquidity showing the well renowned non conventional intervention of the ECB and the extraordinary liquidity preference of the Euro financial system in the deposit facility (DF).